Safety Professional Reference and Study Guide by W. David Yates. This book is written to assist you in achieving that ultimate designation as a safety professional. 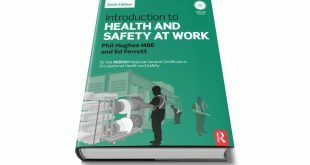 It includes such topics as History of the Safety Profession, Regulations, OSHA Record Keeping, Particulates and Gases, Toxicology, Industrial Hygiene, Ventilation, Noise, Illumination, Biological Hazards, Thermal Stressors, Personal Protective Equipment, Math Review, Statistics for the Safety Professional, Fire Protection and Prevention, Mechanics, Hydrostatics and Hydraulics, Electrical Safety, Engineering Economy, Training.